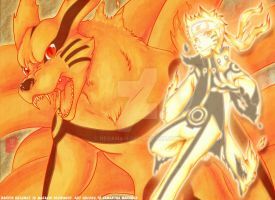 It's Kurama the giant nine tailed demon fox, from Naruto. Hey I'm working on a fan series for Naruto and I was wondering if you would be willing and able to draw some concept art for the characters. PM me if you're interested. Don't know if I had the time for this now but yes why not?? Tell me what you have in mind and i'll check if I can do somthing for you. LOVE Naruto so much, i'm looking for some Naruto content every day of my life, i'm crazy. You're welcome as always i look forward too seeing the talented Katia's art. lol you still remember me by my name, even with all of you're fans? im sure its easy too forget a name of a talentless person. so how is the talented Katia? Well, I feel great this time, I will learn to drive a car so WATCH OUT EVERYBODY! xD And you? How is the super duper wonderful Brandon? Lol really 3 or 4? xD lol im greatful im one of them. Lol watch out world the talented Katia is taking it too the next level, You're next drawing will probably be a drawing of a car i need too get my's soon as well. xD well im sure you will be just as talented at that as you are at drawing. Yeah its a shame too see Flipnote go like that it misses us all. Lol the super duper wonderful Brandon? Isn't that a bit too much for a sorry talenteless person such as me? Well im in need for some art supplys orz im looking for something new, and i need a tablet too post up here. HEY, why are you so mean with yourself? You always say things like,'' I have no talent'' and it's very depressing! Stop that! STOP! STOP! STOP! The talent is always to see further! Talent is confidence! If you make a drop of paint on a white sheet, is considered art in itself. So what's the talent? Nothing can be defined as'' beautiful'' because the way of thinking is different from one person to another. Do not say you're devoid of talent, because it's not true! If you don't like your drawings, you don't like yourself. It's simple. You have to stop comparing yourself to others. It's the best way to see things your way and improve. I think you are a super duper wonderful person, Brandon. That's why your artworks are always beautiful! So PLEASE, start belive in yourself! NOW. Lol i knew you were going too draw a car, well im sure it will be amazing you're very welcome. Too tell the turth i have lost pride in my art all i see in it is trash. I never gave it a second thought. I've seen alot of arist art, how people look up too there art, all the comments they get from it, how lovely there art is. It pains me seeing that i have none of that not one person i can call a fan. Thats when i started looking down on my drawings, pushing my self again again and again. I started seeing it as only trash nothing more nothing less. I look down on my self and my art hoping too become better, hoping too become a great artist, but in the end i always thought i never would. All this just stresses me out but i get what you're saying i will try and believe in my art/skills and me and stop comparing it too others.